Years ago the human race made a tough trade-off to gain a wonderful thing. While we had gotten along just fine for a very long time with the ever-flexible and portable pen and paper, those tools couldn’t support the volume of data our world was generating. Then along came computers, launching the most important revolution this world has known. Yet this also meant trading our reliance on the nimble pen and paper for electronic systems that while being fantastic at collecting and storing information, were difficult to use, resistant to change, and not at all good at organizing information in the same way human minds think. For decades we’ve worked to claw our way back from the downside of that revolution with technology innovations that let us keep all we’ve gained with computers, yet restore the universal flexibility and ease of use we had in a simpler time. It’s an ongoing effort, but it’s the constant little progressions happening in the tech industry that make me believe the quest for flexibility and simplicity is prevailing over the legacy of rigidity and complexity. We’re obsessed at Workday with making sure every single one of our regularly scheduled updates includes new features that keep us on the path of making technology more usable. 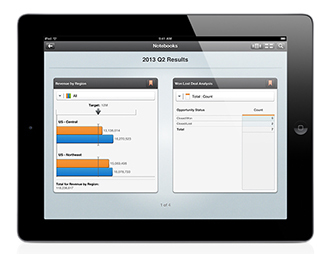 One of these important progressions is a new business management tool, Notebooks, announced today in Workday 20. 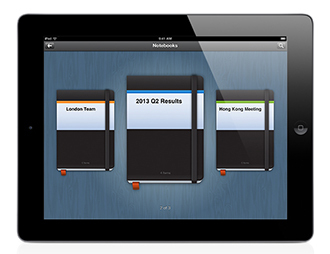 Notebooks, available for the iPad, let business managers organize the information that they care about on an ad hoc basis. It harkens to the idea of having a notebook that you might bring with you for a very specific reason, such as to a cost overview meeting, a workforce planning session, or on visits to your company’s regional offices, containing only the things you need for those meetings or visits. The concept is simple: you create a notebook, tap the bookmark symbol on things within Workday you want to put in your notebook, and when you open the notebook that information is automatically organized and available. You might have a notebook for a talent calibration and review meeting at the London office containing profiles of local employees and the results of some workforce planning analytics. Or, you might have a notebook for your company’s quarterly business review containing financial reports and some analysis on expenses and accounts payable. You could have any combination of data or analytics you’ve pulled related to finance, HR, talent management, expenses, and payroll that are relevant to you in a particular notebook, and look through your notebook by tapping and swiping the iPad screen. The Workday architecture makes this possible because it supports all of your organization’s HR and finance data in one place. The cloud plays a valuable role, too, by making it possible for your notebooks to be repositories of real-time data, unlike the static data in a paper-based notebook. So if you pulled in some financial analytics for a report in preparation for a trip to a regional office, and then your company wins and records in Workday a new deal in that region, the data in your report automatically updates in your notebook. In my mind, it’s innovation like Notebooks that continue to flip the model of what enterprise software had been about for more than 30 years. Before it was about collecting a lot of information from a lot of people, and making it accessible to only a few people. Part of this quest toward making technology more usable in our industry is to ensure we’re getting the right information to the right people when they need it without any hassle or complexity. The enterprise software industry has made good progress from a state of having very poor accessibility to information to offering up dashboards for viewing and organizing information, but the dashboard concept is only partly flexible. The dashboard itself is part of the software application and deployment. The natural next step is giving people the freedom to organize and view information entirely ad hoc on a project basis. There’s plenty of inspiration in the consumer world of tech that show how multiple data feeds and sources can be pulled together in one place for a single purpose. Think of applications that pull all of your hotel, dining, and car reservations together for your next trip, or applications that let you find and organize your favorite recipes, or apps that organize your bank accounts and investments in one place. Why can’t there be this sort of effortless personalization in the enterprise? There’s no good reason why. That tough trade-off we had to make is fading into the past. We know that by the small yet important progressions we see around us every day.